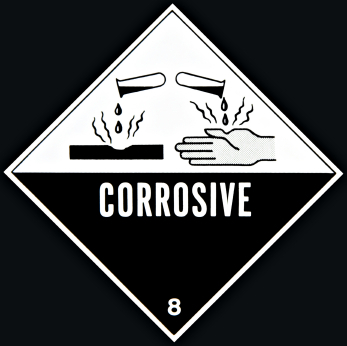 What do you think of when you hear the word “acid?” My mind goes to car batteries and high school chemistry lab. Ask anyone you can think of if they would want acid on any part of their body and they’ll look at you like you’re crazy! What folks probably don’t know is that anyone who’s ever had a cavity has bathed their teeth in acid! A cavity is simply a hole eaten into a tooth with acid. Nothing more, nothing less. So how does the acid get there? You’re probably thinking, “I certainly don’t put acid on my teeth!” Acid can get onto your teeth in two ways. The first way you can get acid on your teeth is from bacteria in your mouth. These bacteria like to eat the same things people do and their favorite food is sugar (sucrose). But just like all other living things, bacteria produce waste products that they have to get rid of. The waste product that bacteria make is acid. The more sugar you eat and the more bacteria you have on your teeth, the more acid is produced. This acid can eat a hole in your tooth and once this hole is big enough…it becomes a cavity. The other way that we can get acid on our teeth is through our diet. 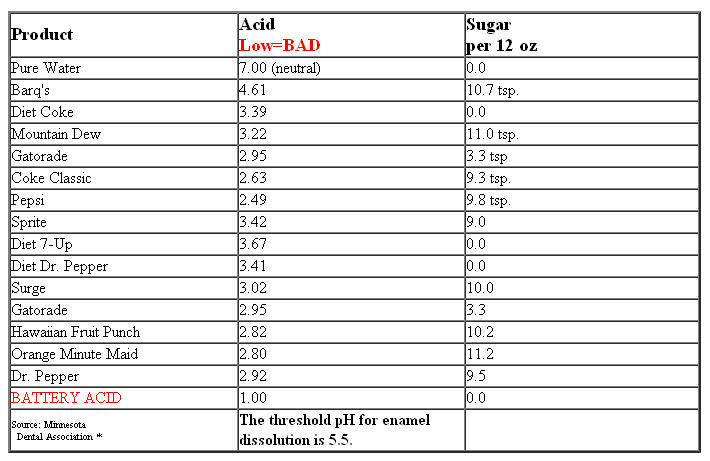 There are lots of foods that we eat that are acidic in nature. Some foods get their distinctive flavors because of this acid. Tomatoes, oranges and lemons all have a lot of acid in them. I have treated patients that actually had enamel loss due to a history of eating lemons. So what foods are the worst for creating acid which then creates cavities? Probably the number one cavity creating food is pop. Regular “non-diet” pop has a ton of sugar as well as a ton of acid. This combination of sugar and acid can start digging holes in teeth pretty quickly. Diet soda is probably better for your teeth than regular soda, but it also has a pretty low pH so it’s still pretty tough on teeth. What’s the solution for this acid problem? Regular brushing and flossing and limited exposure to high acid foods, especially soda. Chewing sugarless gum after meals is something small that you can do that makes a big difference to the pH of your mouth after meals! Also, regular dental appointments can help you see if you’re a “high acid risk.” We’d love to have you as a patient here at Mead Family Dental. If you would like to make an appointment you can call us at (989) 799-9133 or feel free to email me directly at alan@meadfamilydental.com.